KUNDU ANTALYA east of the province, is in the municipality of AKSU and Kepez. 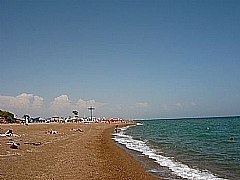 LARA began to be founded in the early nineties in the continuation of this beach resort, starting from Lara beach, it has a Belek beach stretching to the border. 6 km to ANTALYA Airport. from KUNDU who is neighbors with LARA and AKSU districts. Although the hotel is planning for KUNDU, although there are numerous villas were built around the site or type of building, urbanization has been in terms of development. In addition to the big hotels settled by the sea, there are also boutique hotel and boarding house types in the inner part. To answer every need KUNDU where the shopping centers, is available in several small markets to respond to incoming guests. KUNDU, ANTALYA and is usually found in five-star hotels. Many of these hotels "all inclusive" will work with the system. These hotels, which can be built in daily accommodation, are completely full in summer. Daily guests are also available at the hotel.These hotels, which are in world standards in terms of visual and service, restaurants, bars, disco, sports halls, entertainment centers, children's training centers, small bazaars and water sports. Guests staying at hotels, KUNDU located for visiting other places of historical and natural ANTALYA rent a car companies are benefiting from. BELEK, SİDE, MANAVGAT ASPENDOS, LARA, BELDİBİ, GOYNUK, KEMER, are the most visited places. KUNDU ANTALYA rent a car companies generally operate in and KUNDU ANTALYA Airport. Hotels in the rent a car is more economical to rent a car here than in the office. KUNDU rent a car service which gives our company from ANTALYA Airport and ANTALYA City Center is well located office to assist you. KUNDU located off during the winter months rent a car for passes to the activities in the summer. We will pick you up from the service, your car to your hotel, your address or ANTALYA airport. You can rent any of our affordable, automatic, diesel and petrol vehicles that are in our possession so that your short journeys can take place without any problems. KUNDU ANTALYA Rent a Simply fill out the reservation form on our homepage to benefit from care. At the same time from us by mail or telephone way you can get to rent a car service. We are in the car in every class, maintenance is done by the services in a timely manner. KUNDU ANTALYA rent a car, car rentals will assist you with every hour of the day. Please visit our Rental Terms page before renting your car.